The below mentioned products were given to me at no charge for review. I am not being monetarily paid for this review (other than receipt of the free product). I will give my honest opinion and thoughts regarding said products. I was asked if I'd like to review a few flipflop wines and since my neighbors and I have an ongoing Friday night date - that includes letting the children run wild in the streets while we sit in lawn chairs in someone's driveway observing said children so as to avoid all physical injuries and property damage - where we enjoy a bottle of wine or a pitcher if Margaritas and chat. And by chat I mean complain about our kids and spouses and jobs. Of course I was all over the opportunity. Seriously. Free wine? Shipped to my door? Who would say no to that? Wine that it turns out is darned tasty and affordable too. I am still acclimating, or training my taste buds, to the red wines. And I'll be honest, everything I know about wine I read on the back of the box. Back in the day when wine was purchased in a box, then mixed with sprite or ginger ale over ice to make a "spritzer" because that was the cool way to drink wine without actually drinking wine at all because back then, wine was for old people. I've changed. I buy wine in bottles now. Because I'm mature. And that's what grown-ups do. Know what else we do? We buy stuff we can afford. Don't get me wrong, I'd love to drop a crisp hundred bucks on a really nice, smooth bottle of wine and share it over a meal with my husband. Except he doesn't drink and I can't fathom spending that kind of money on a beverage. That is part of the beauty of the flipflop wine line. 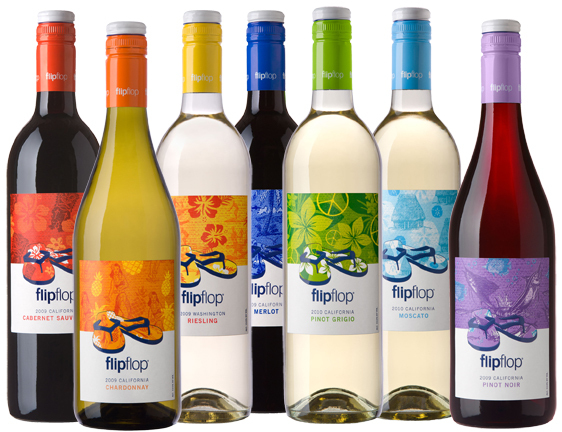 They offer "good wines that complement the everyday casual lifestyle" according to David Georges, flipflop wines Vintner (Vintner = wine merchant). 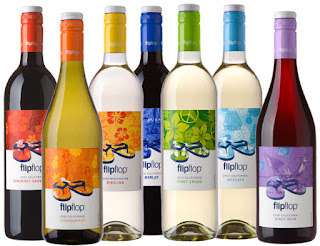 Each flipflop wine retails for about $7US. I tried a Merlot, Pinot Noir and Cabernet Sauvignon. Like I said before, I'm learning to like reds because whites are traditionally my favorite (ever since I started a) buying my own wine; and b) purchasing wine in a bottle). A few things I appreciate about the flipflop line is that they were designed to be great tasting and affordable to all. I especially appreciate the screw top. I'm no wine snob, and I like the idea of a traditional cork, but I like the practicality of putting the lid back on and saving the rest of the bottle for another time. I also appreciate that flipflop wines has partnered up with Soles4Souls to help them achieve their goal of gathering 11 million pairs of shoes in 2011 for children and adults in need. Each bottle of flipflop wine sold sends a pair of flipflops to someone who doesn't have shoes. I most appreciate the philosophy behind flipflop wines - "to each, their own." Because I don't prescribe to traditional wine drinking, I don't pair my wine with my food and stick with a strict this + that = tasty. I am learning to like new things, but in the meantime, I'm still drinking Zin with nearly every food I eat. I'm a rebel.